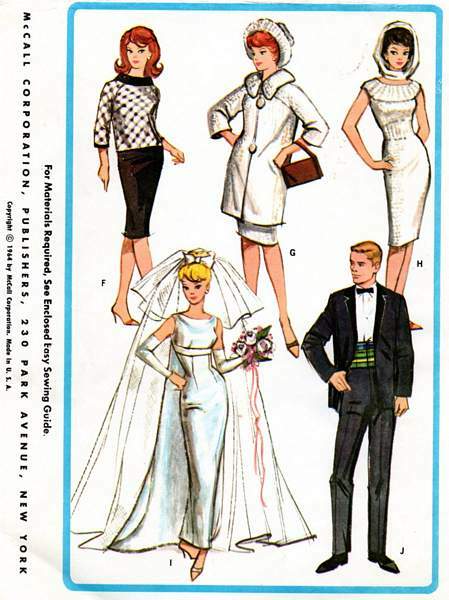 Original Official Mattel Barbie pattern to make ten outfits for Barbie and Ken dolls. Pattern is used. The pieces are neatly cut. One small piece - for the shoes - is missing. Please see additional image below showing the reverse side of the envelope. Envelope and contents are in good condition. All the doll and doll clothing patterns on our site are authentic, original patterns. We do not list any reproduced or photo copied doll or doll clothing patterns.